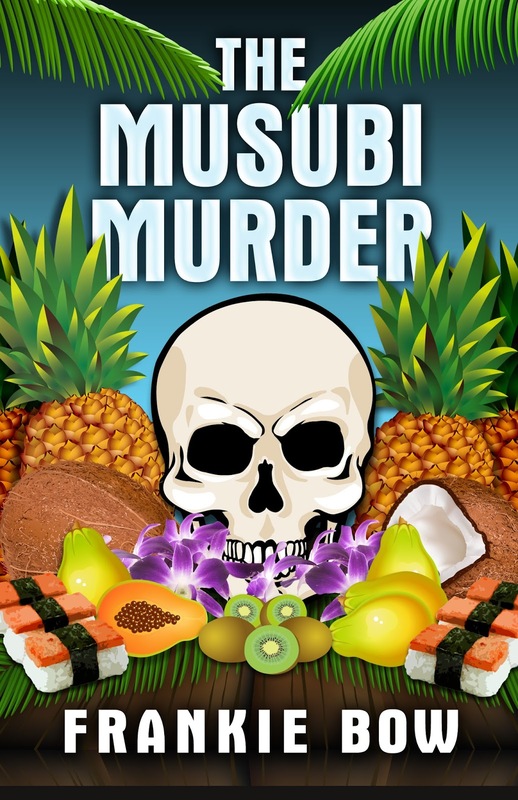 I just read a really good book, y'all — The Musubi Murder by Frankie Bow. Let me tell you a little about it. 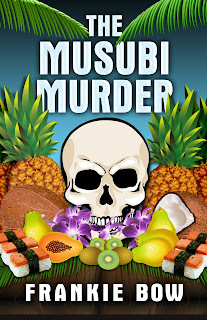 The Musubi Murder is a cozy mystery, the first book in the Molly Barda Mysteries. 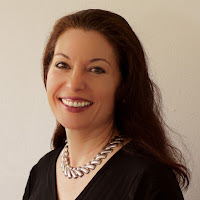 In a recent Q&A on Goodreads, Author Frankie Bow mentions that she is currently writing the fifth book in the series, Molly Barda and the Blessed Event. The Prequel (The Case of the Defunct Adjunct) and Books Two (Molly Barda and the Cursed Canoe), Three (Molly Barda and the Black Thumb), and Four (Molly Barda and the Invasive Species) are completed and waiting on edits. You can read excerpts from these further adventures of Molly here on Frankie's website. They all sound very interesting; I am looking forward to reading them, after they are released into the Real World. The Musubi Murder is LOL funny, so choose your reading environment wisely. The action is told from the first-person POV of Molly Barda, who has a zany, quirky sense of humor (thus, my many LOLs). There are other characters with funny lines also — characters whom I hope to see in the future books — especially Molly's colleagues, Emma Nakamura and Patrick Flanagan, and Molly's possible love like interest, Donnie Gonsalves. The Musubi Murder takes place in Mahina, Hawaii. One of the settings is the Mahina State University, where Molly Barda teaches in the College of Commerce. The College of Commerce is in the midst of budget cutting and budget restraints, so no one says no to a huge donation from Jimmy Tanaka, "The Most Hated Man in Hawaii." I like how Author Frankie Bow begins The Musubi Murder with immediate action (at the Breakfast Meeting of the College of Commerce Friends in the Business Community, to honor Jimmy Tanaka and his fat donation), instead of starting with the more-typical description of the protagonist to the reader (which can seem forced and hokey). Frankie gives us Molly's details on a need-to-know basis, not as an info-dump, which is refreshing. "Molly, I have an opportunity for you." "An opportunity?" I repeated, without enthusiasm. Oh, good. Next comes the part where he tells me to be a "team player," and then dumps some tedious task on me. "It's a chance for you to show that you can be a team player," Bill Vogel said. We don't have any budget for office furniture, so when my old office chair collapsed, I replaced it with an off-brand yoga ball from Galimba's Bargain Boyz. It's the nicest piece of furniture in my office. My vintage cotton dress felt tighter around the waist than when I'd bought it, probably because of something the dry cleaner did. "...we all thought Pat was taking notes on his laptop, but it turned out he was updating his newsblog, and in between he was writing fake reviews for all of us online." "On that professor rating site that shall not be named," I added. "Those are fake?" Donnie looked genuinely surprised, which surprised me. "Most of them," I said. "The well-written ones, anyway. I thought everyone know that." "That explains quite a bit," Donnie said. "Donnie," Emma giggled, "did you search for Molly online?" "Of course. I had to do my due diligence." "I'm very easy to find, unfortunately. Not a lot of Molly Bardas out there." "You could get yourself a more common last name," Pat said. "Like Gonsal — ow!" "How about bringing in home-baked muffins?" Pat suggested. "Like what's her name, in my department?" "Ew," Emma said. "The one who gives the students backrubs?" "Yeah, that's the one. Her students love her. If part-timers were eligible, she'd get the teaching award every year." "I don't even touch my students." I said. "I'm certainly not going to start giving them backrubs. I guess I could try baking muffins." "Molly, don't you use your oven to store your extra shoes?" Emma asked. I was about to check the pantry when I spotted a large cockroach sitting next to the kitchen sink. I retrieved my hand vac from its charging station, crept up slowly, and then with one swift action I sucked the cockroach in with a decisive "thwack." After I'd shaken the angry insect into the toilet and flushed six or seven times, I got out the rubbing alcohol and wiped down every surface in the kitchen. My kitchen smelled like an infirmary, but at least it was clean. I was still washing my hands when I heard a knock on the door. "I thought it might be a little late for coffee," Donnie said. "So I took the liberty of bringing some wine." He strode in, gave me a strong one-arm hug and cheek kiss, and headed into the kitchen. "Do you have a corkscrew?" He sniffed the air. "Fine. It smells really . . . clean in here. Do you have wineglasses?" I hope these examples are enough to convince you that The Musubi Murder by Frankie Bow is a Must-Read. 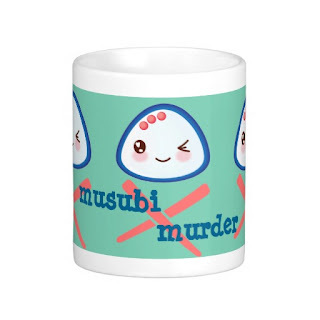 I recommend The Musubi Murder to all cozy fans! Those of you who are residents of Hawaii, frequent fliers to Hawaii, or in academia will especially love it. 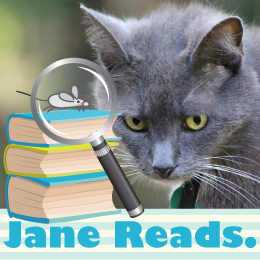 Four Kitties for The Musubi Murder by Frankie Bow — I really enjoyed it! 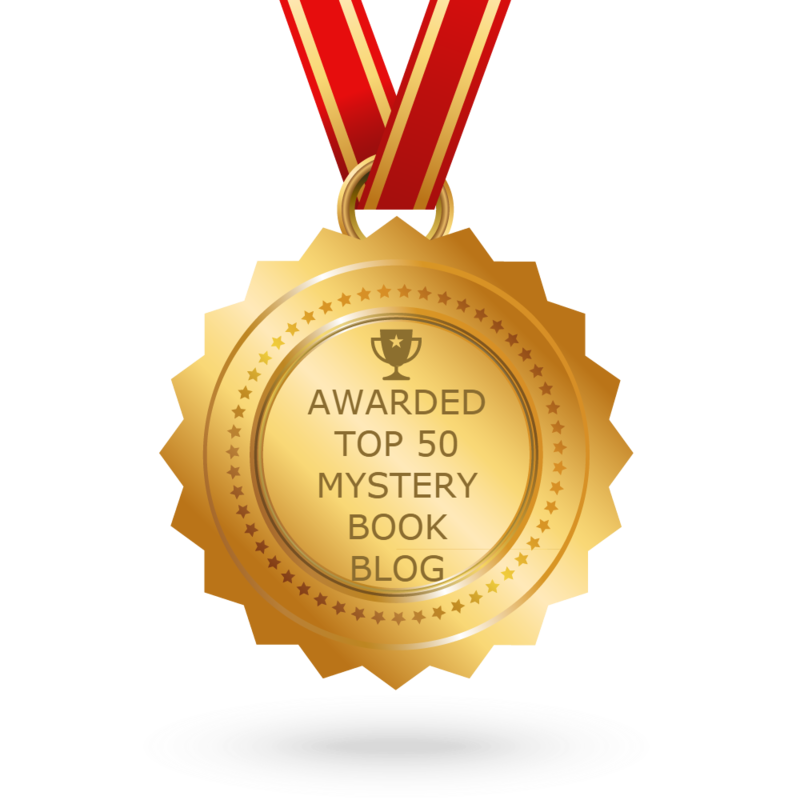 Note: I received a complimentary copy of The Musubi Murder in exchange for my honest review. Follow the tour, to read other reviews and Author Guest Posts, plus Author Interviews! 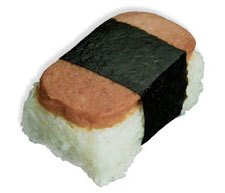 There was a time, back when I was living on the mainland (more properly referred to as the Continental United States) when I, too, had never heard of a Spam musubi. In fact, I wouldn't have dreamed of eating Spam. I thought of it as meat particleboard, a composite of unspeakable animal parts. 1) A Spam musubi is not sushi. It's a local adaptation of the Japanese o-musubi, which is a rice ball often included in kids' lunches. The reason it doesn't properly count as sushi is that sushi is made with vinegared rice, while the rice in a Spam musubi is plain. 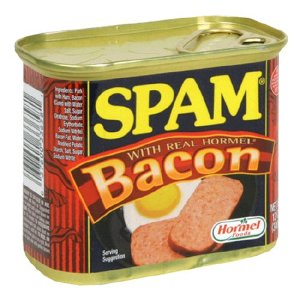 2) Spam is not a composite of unspeakable spare parts. Spam is shoulder pork and ham. 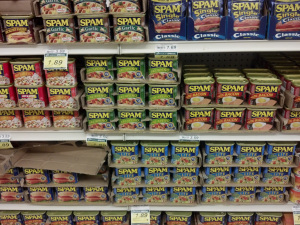 Original Spam has only six ingredients, fewer than a typical package of hot dogs. 4) Spam comes in flavors! Bacon is my favorite. Black pepper is a close second. If you want to see how Spam-based snacks figure into the plot of a murder mystery, check out The Musubi Murder, available in hardcover and audio!